The Association is a community-controlled social landlord operating in the Govanhill and Merrylee neighbourhoods of Glasgow. We own and manage more than 2,500 homes for social rent and we factor a further 1,400 privately owned properties. Govanhill is dominated by tenement housing, most of it built between 1890 and 1912 and with some interwar tenements too. It has been a popular settlement area, whether temporary or permanent, for people coming to Glasgow and Scotland for well over a century and is today the most ethnically diverse neighbourhood in Scotland. Registered in 1974, the Association’s roots lie in Glasgow’s policy of large-scale demolitions of slum housing from the late 1950s/1960s onwards, which saw the dispersal of people living in inner-city communities to a new generation of council houses on the city’s outer edges. Some communities, including Govanhill, largely escaped the bulldozers but there was no political, strategic or financial plan in place to deal with the appalling housing conditions that remained. By 1974, legislation and funding structures finally caught up with the need to deal with sub-tolerable tenement housing. The local authority acquired powers to declare housing action areas for Improvement, and grants became available to buy and refurbish tenement housing. This facilitated a new breed of housing associations – Govanhill among them – which acted as buyers, developers, and managers of tenement housing. Led by local residents, these housing associations were to become renewal agents in working class communities throughout Glasgow and a shining example of people power in action. For a decade after 1974, most tenement housing in Glasgow was treated on a “patch and repair” basis. Prolonged campaigning by the city’s housing associations finally achieved a commitment to a fully comprehensive approach, improving whole blocks to higher standards and changing the mix and size of housing layouts within the tenements. This distinction is critical to understanding Govanhill’s housing stock today, in particular, the smaller flats that were typically produced during the first decade of the Association’s history. Central and local government support for comprehensive tenement improvement programmes in Glasgow came to an end in the early 2000s. This has contributed to major structural changes in Govanhill’s housing system, along with a substantial reduction in owner occupation, rapid growth of private landlordism at the lower end of the market, a major influx of migrant workers from eastern European EU accession states, increases in population density, and deterioration of the building fabric and environmental conditions. Despite limited development opportunities, the Association has completed just over 200 new build houses since the early 1980s. This has helped to increase diversity in house types and sizes, but the scale of the programme has not been sufficient to meet all of the housing needs present in the area. 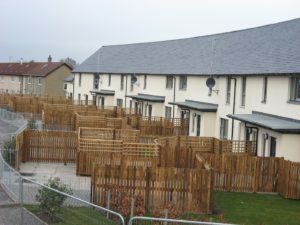 The Association experienced further growth in 2010, when second stage transfers from Glasgow Housing Association (GHA) in Govanhill and Merrylee were finally completed, following a seven-year transfer process. The ex-GHA housing in Govanhill is located in the Association’s traditional area of operation. By contrast, Merrylee is a separate neighbourhood, to the south of Govanhill between Newlands and Cathcart. Community governance has remained part of the Association’s organisational DNA for the last 40-plus years. It has been the foundation for sustainable regeneration, better long-term value for public money, and a wide range of achievements. We have improved more than 1,400 tenement properties, and 600 more on behalf of other owners. We have built more than 200 new homes to complement the tenement rehabilitation programme, address housing mix imbalances and meet particular needs. We have invested £36 million in our tenants’ homes since 1999/00 through substantial programmes of major repairs and planned maintenance, providing new kitchens, bathrooms, windows and central heating systems that have improved standards of energy efficiency and helped to address fuel poverty. We have brought community ownership to more than 700 ex-council homes in Govanhill and Merrylee, following successful tenant ballots in 2010. We established Govanhill Community Development Trust (GCDT) in 1992 as a subsidiary of the Association. GCDT has gone on to become a highly successful and sustainable social enterprise, undertaking substantial regeneration work in the community and supporting local business. We host the Govanhill Service Hub, which brings together a wide range of agencies to work together on local issues that require a multi-agency response. We provide Govanhill residents with excellent financial support services. These services have been expanded in response to welfare reform, with the Govanhill Welfare Reform and Financial Literacy Hub helping around 1,000 local residents to obtain an estimated additional £1.6 million from benefits and tax credits during 2016/17. We provide a factoring service to 1,400 properties in other ownership, a critical service in providing good standards of neighbourhood management. The Association and local residents successfully campaigned for Scottish Government recognition of the very poor quality of housing and environmental conditions in South-West Govanhill. Under funding agreements with the Scottish Government and Glasgow City Council, we now play a leading role in improving these conditions.